I cheat on books regularly. Were I to write my confessions, I would have to admit to buying books for purely aesthetic reasons. Some I bought for their covers, some for the feel of the paper, and some I had a genuine interest in -- until a newer, glossier novel caught my eye. My first encounter with Gayle Forman's If I Stay began like most of my romances -- for purely physical reasons. But something told me this book was "the one." And sometimes you just can't let a special book go. A novel about a teenage musician is a far departure from the traditional model of a thriller. There are no ruthless men with guns, no diabolical lawyers, no serial murderers. Although it may not be a thriller in the traditional sense, it incorporates the one perpetual question that lies at the heart of every suspense novel: Will the protagonist survive? The twist that Forman incorporates, however, is that the answer lies with the protagonist herself. The book centers on Mia, a young cellist whose life is imperfect but securely ordinary. She grapples with typical teenage dilemmas, but these seemingly imperative issues are quickly forgotten when an accident kills her and her family. Mia finds herself trapped in a world somewhere between life and death. Like a traditional thriller, this is a novel based upon choices. However, the choices aren't which villain to chase, which door to open, or which agent was leaking information. The main character must choose between returning to her destroyed life or simply letting it all go. And, like any great thriller, neither option affords an easy alternative. This is perhaps the most important lesson I learned from Forman, one that I strive to incorporate in all my novels. Tension isn't necessarily created by murderers with pitchforks. It can exist by confronting the protagonist with an impossible decision and seeing what happens. With every turn of the page, I felt Mia's decision lurking just around the corner. Mia's predicament evoked such anxiety from me because her internal conflict was so far from natural, so far from anything I've had to experience. My fear heightened the moment her subconscious mind realized her loved ones had died and she had to make the ultimate decision. Which life would she choose? Which would I choose? I hadn't planned on getting serious about If I Stay. It was a passing fancy with a gorgeous cover. But every moment I spent reading Forman's masterpiece drew me in more. Whether you're talking about a thriller, a young adult novel or a first date, it's the connection you feel that makes you want to learn more. Because of my connection with Mia, my relationship with buying, reading and writing books has never been the same. You Must Read This is produced and edited by Ellen Silva. Editorial assistance was provided by Miriam Krule. Kaleb Nation was just 21 years old when his novel "Bran Hambric: The Farfield Curse," was published in 2009. For our series "You Must Read This," in which authors recommend a book they love, Nation suggests readers take a look at the young adult novel "If I Stay," by Gayle Forman. It's an unconventional thriller about a young girl facing big life choices. Mr. KALEB NATION (Author, "Bran Hambric: The Farfield Curse"): I cheat on books regularly. Were I to write my confessions, I would have to admit to buying books for purely aesthetic reasons. Some I bought for their covers; some for the feel of the paper; and some I had a genuine interest in - until a newer, glossier novel caught my eye. My first encounter with Gayle Forman's "If I Stay" began like most of my romances - for purely physical reasons. But something told me this book was the one. And sometimes, you just can't let a special book go. A novel about a teenage musician is a far departure from the traditional model of a thriller. There are no ruthless men with guns, no diabolical lawyers, no serial murderers. Although it may not be a thriller in the traditional sense, it incorporates the one perpetual question that lies at the heart of every suspense novel: Will the protagonist survive? The twist that Forman incorporates, however, is that the answer lies with the protagonist herself. The book centers on Mia, a young cellist whose life is imperfect but securely ordinary. She grapples with typical teenage dilemmas, but these seemingly imperative issues are quickly forgotten when an accident kills her and her family. Mia finds herself trapped in a world somewhere between life and death. Like a traditional thriller, this is a novel based upon choices. However, the choices aren't which villain to chase, which door to open, or which agent was leaking information. The main character must choose between returning to her destroyed life, or simply letting it all go. And like any great thriller, neither option affords an easy alternative. This is perhaps the most important lesson I learned from Forman, one that I strive to incorporate in all my novels. Tension isn't necessarily created by murderers with pitchforks. It can exist by confronting the protagonist with an impossible decision, and seeing what happens. With every turn of the page, I felt Mia's decision lurking just around the corner. Mia's predicament evoked such anxiety from me because her internal conflict was so far from natural, so far from anything I've had to experience. My fear heightened the moment her subconscious mind realized her loved ones had died, and she had to make the ultimate decision. Which life would she choose? Which life would I choose? I hadn't planned on getting serious about "If I Stay." It was a passing fancy with a gorgeous cover, but every moment I spent reading Forman's masterpiece drew me in more. Whether you're talking about a thriller, a young adult novel or a first date, it's the connection you feel that makes you want to learn more. Because of my connection with Mia, my relationship with buying, reading and writing books has never been the same. 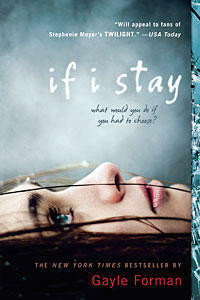 SIEGEL: "If I Stay" is by Gayle Forman. Kaleb Nation's most recent book is "Bran Hambric: The Farfield Curse." You can find this, and other recommendations in our "You Must Read This" series, at npr.org/books. You can also find NPR Books on Facebook. Just click "like" to get recommendations, new stories and more from our community of readers. Transcript provided by NPR, Copyright NPR.